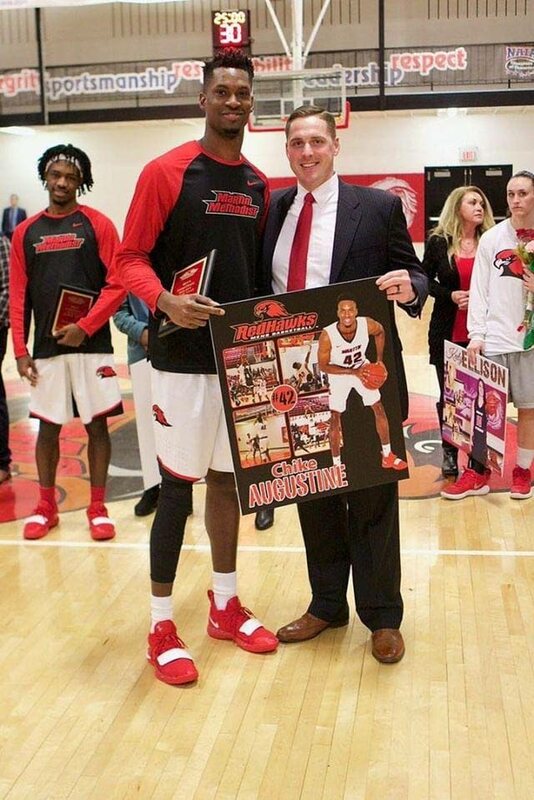 TT’s Chike Augustine was recently honoured by coaches in his final collegiate game with Martin Methodist College (MMC) on February 28. Augustine, who is from Upper Pashley Street, Laventille, was recognised for his four years with the Red Hawks by coach and technical director of MMC following the team’s season ending battle versus Stillman College in the Southern States Athletic Conference (SSAC) Men’s Basketball Championship held from February 26 to March 2. The six-foot 10-inch forward received an athletic scholarship in 2015 following his participation in the Caribbean Hoops 25/8 Exposure Camp in Trinidad. In his four years on the collegiate circuit, Augustine, who was known for his defensive presence, was able to accumulate 294 rebounds and 85 blocks in a total of 97 games throughout his career. In the 2016-2017 season he was ranked number 17 in the National Association of Intercollegiate Athletics (NAIA) Division I SSAC in total blocks (42), and number 18 in blocks per game (1.400). Augustine is currently pursuing a BSc. in Sport Management and is expected to graduate in May. He has expressed future plans on doing broadcasting journalism and encourages children to get into sports. In a past interview with the National Basketball Federation of Trinidad and Tobago, Augustine was thankful for his involvement in basketball as it provided him with an opportunity to further his education while applying his athletic skills. Reply to "TT basketballer Augustine honoured"